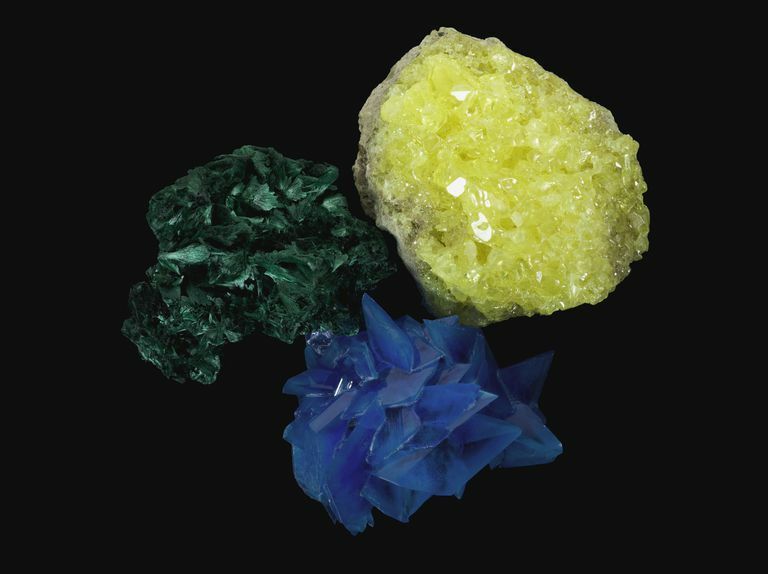 If you enjoy growing crystals, try this simple project that produces large crystals that change color from yellow to green to blue depending on light and temperature. The crystals grow over a few hours to overnight and are sure to amaze! Alum is easy to find, but you'll likely need to order red prussiate online. Another option is to simply order a color change crystal kit. The one by Thames and Kosmos is reliable and includes a total of three experiments. In a small clear container, simply dissolve the potassium alum and red prussiate in 50 milliliters of hot water. It make take a few minutes for the salts to fully dissolve. If you still have undissolved material after a couple of minutes, you can carefully set your container inside another larger container of very hot water, to act as a hot water bath and help the salts dissolve. Once the chemicals are dissolved, set your container of chemicals in a location where the crystals can grow without being disturbed. You'll start to see tiny crystals after 30 minutes to a couple of hours. Crystal growth should be complete overnight to a couple of days, depending mostly on temperature and the humidity of the air. At this point, the crystals will be yellowish green or green, depending on the temperature at which they grew. When you are satisfied with the crystal growth, use a spoon to remove the crystals from the container. You can set them on a saucer to dry. Dispose of the chemical solution by pouring it down the drain and rinsing with water. The easiest way to observe the color change is to divide the crystals between two containers. Place one container in a dark cabinet or closet and put the other container on a sunny window sill. Light and heat supply the energy to cause a chemical reaction between the alum and red prussiate to produce Prussian blue or Berlin blue. This is an iron-based dye still in use today for blue ink cartridges and paints. The chemicals used in this project are safe to use, but you should wash your hands after handling the crystals, because the red prussiate and your crystals contain iron, which can be toxic if you get too much. Keep the chemicals and crystals out of reach of pets and young children for this reason. The kitchen is a perfect place to mix the solution and grow crystals, but be careful you don't get burned by the hot water and be sure to keep the chemicals and crystals away from food. Rinse any kitchen cookware you use so it doesn't have chemical residue.